Ontario will no longer allow orca whales to be put in tanks for profit. 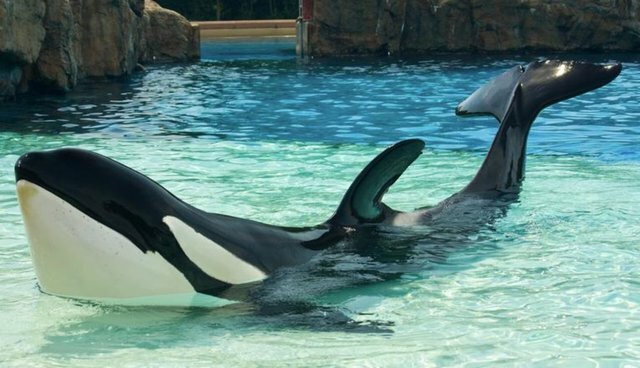 The ban is a symbolic victory for the province's only captive killer whale, Kiska, who was caught in the wild and has been living in her concrete tank in the Marineland amusement park for 37 years. Phil Demers, a former senior trainer at the park who is now campaigning against the park's poor animal welfare standards, told The Dodo that the lack of laws around marine mammals made it impossible for him and his colleagues to report the animal neglect they witnessed. "Today is a start," he said. "Hopefully it's the beginning of the end of marine mammal captivity in Ontario. It's a good feeling knowing Marineland will never have another captive killer whale. Kiska will be their last." "It is our opinion that the present standards of care that apply to marine mammals in public display facilities are insufficient." Ontario isn't alone in turning its back on marine mammal captivity. Last October, the San Francisco Board of Supervisors passed a measure stating that cetaceans (whales, dolphins and porpoises) have the right to be free from life in captivity. In California, a bill was introduced in early 2014 that would make it illegal to "hold in captivity, or use, a wild-caught or captive-bred orca for performance or entertainment purposes." And last March, a New York Senate Committee approved a "Blackfish bill" to ban any future parks from keeping orcas in captivity. Marineland, in Niagara Falls, is the only park in Ontario to keep an orca - and it may be the last. Last July, photos showing Kiska's blowhole severely indented and her dorsal fin crumbling led marine mammal scientist Dr. Naomi Rose to describe her condition as "an infection that is causing the tissue to lose its integrity...she is NOT in good condition." Marineland's history with marine mammal welfare has been questioned before. The Toronto Star has been conducting an ongoing investigation into the conditions at the park, finding four young belugas who died over just four years, poor water quality that led to dolphins' skin falling "off in chunks," and walruses left alone for long periods of time and kept in dry, cramped pens. "All our facilities are legal...We take care of the animals - better than I would take care of myself."